Live oak trees are popular in residential areas because of their sweeping branches, their ability to be evergreen in many areas and the shade that they provide. However, live oaks are susceptible to a number of disease factors that can cause them to languish or even die--sometimes taking years to do so--while residential protective codes prevent you from removing a tree that has become a liability. The best defense against live oak disease is to recognize the infections in all forms so you can deal with the problem effectively before it kills the tree. Live oak diseases come in many forms. Oak wilt is a fungal infection that affects all oak trees, including live oaks. Root rot, powdery mildew, oak bark beetles and oak beetles also can create serious problems for your live oak tree. Even that holiday favorite, mistletoe, can create health problems for your live oak if it takes up residence. 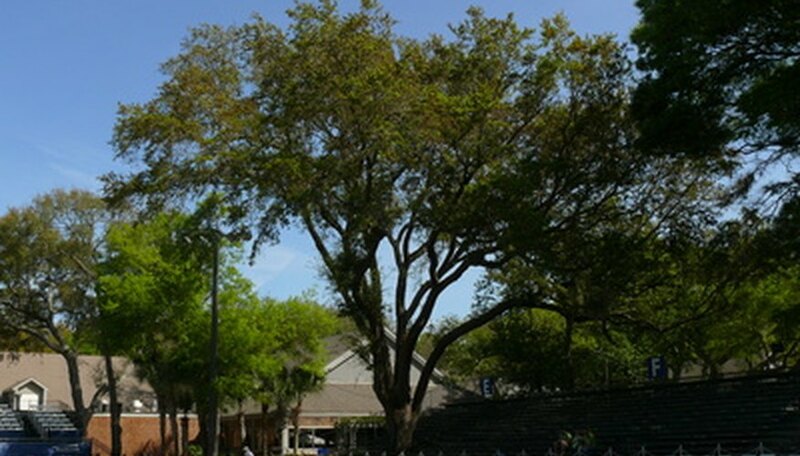 While there are myriad types of live oak tree disease, the symptoms are fairly universal. This is one reason that it can be hard to diagnose the problem. Common indicators of live oak tree disease include yellow and brown leaves, leaf fall, dead leaves hanging on the tree and leaf galls. Other symptoms include rough, calloused bark, dead twigs and branches and branches that are covered with a white substance. While the symptoms are largely the same for many types of live oak tree disease, the details of the symptoms may give you a key to diagnosing the problem. Oak wilt causes leaves to wilt and fall, but in many cases they will still be green when they do so. Root rot, on the other hand, simply thins the entire canopy but leaves the dead leaves hanging on the tree. Powdery mildew is nearly always the source of the white substance on the branches, while oak bark beetles and oak beetles kill the leaves and knock them to the ground nearly immediately. Unfortunately, live oaks often do not survive many common diseases. Oak wilt is particularly deadly, and while a tree may fight it for years, your only contribution to the battle will likely be chemical treatments to surrounding trees to prevent the spread of the infection. However, root rots can often be treated by watering the tree deeply but less frequently to starve the fungus causing the problem and by treating the soil around the tree with fungicides, while oak beetles often can be eradicated with pesticides. When you are dealing with live oaks, you must remember that there are many, many regulations protecting this tree. In many areas, you do not have the option of simply removing affected branches or even a dying tree to save the surrounding trees without local government approval. Do not take drastic treatment measures with your live oak tree unless you have ascertained that these measures will not result in fines.